UK streaming service Lovefilm are getting all historical again, after it was revealed they have picked up the second season of Vikings from MGM Television. The Norse show which stars Travis Fimmel and Katheryn Winnick, returns after all 9 episodes of the first season were nabbed by Amazon-owned Lovefilm last year. The original deal was a first for Lovefilm in aquiring first run streaming rights to a show. 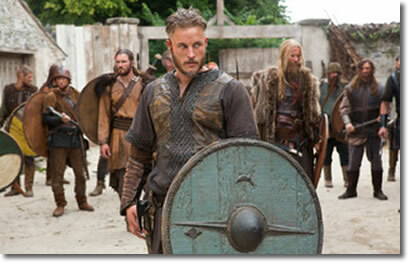 All 10 episodes of season 2 of Vikings will start becoming available from February 28. Every weekly episode will be made available the day after airing on the History channel in the US. In the second season of Vikings, the Norse warrior Ragnar Lothbrok (Fimmel) who is now Earl and allied with King Horrik, becomes more powerful as he continues with his men, to explore and pillage new kingdoms. In the US, Vikings can be watched on the Amazon Prime Instant Video service.